Tiny cars for tiny hands. Make them on your scroll saw from scraps of .75 inch stock. They make great projects for kids, scout groups, etc. And at about 35 cents per car, they’re very inexpensive to make! 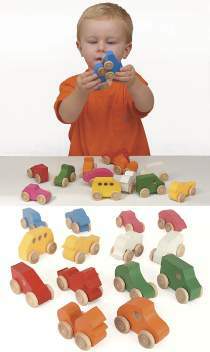 Plan includes fourteen different designs, cars, trucks, vans and 6 different animal shapes. They measure approximately 2-1/2" to 3" long. All patterns drawn FULL SIZE. Order wheels and axles separately. 14 different designs.